September has begun with heavy precipitation falling in parts of the key corn growing state of Iowa. 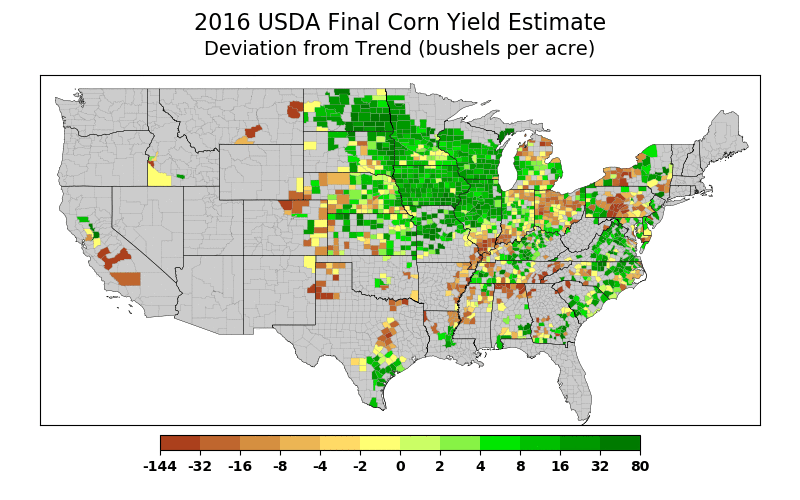 This has raised concerns on whether this could detrimentally impact corn yield. In order to quantify the potential impacts, we can examine historical CropProphet databases and end of season yields to assess whether these concerns are valid. 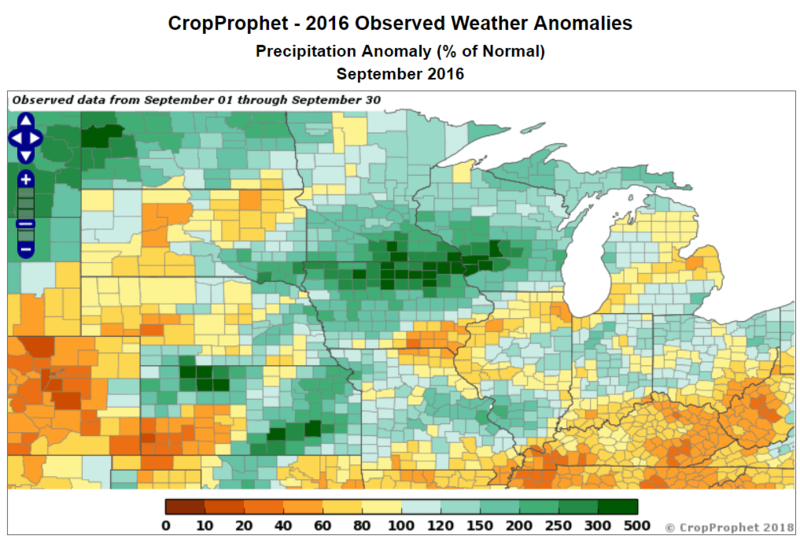 Heavy rains in Iowa during September are rather rare, but 2016 was quite wet and in fact was the wettest September since 1986. The map below shows the percent of normal precipitation for September 2016, with precipitation totals exceeding 300 percent of normal in many counties in northern Iowa. To examine the localized impacts in more detail, we selected a county (Hancock) in north central Iowa where rain gauge observations from September 2016 exceeded 10 inches. The operational CropProphet forecasts in 2016 showed only modest yield declines in September, with Hancock and the surrounding counties decreasing by approximately 5 to 10 bpa during the month. The 2016 CropProphet end of season corn yield forecast for Hancock county still expected an above trend year at ~195 bpa, and remarkably the final USDA estimate came in at 200.3 bpa, which was only 1 bpa below the record high set in 2015. 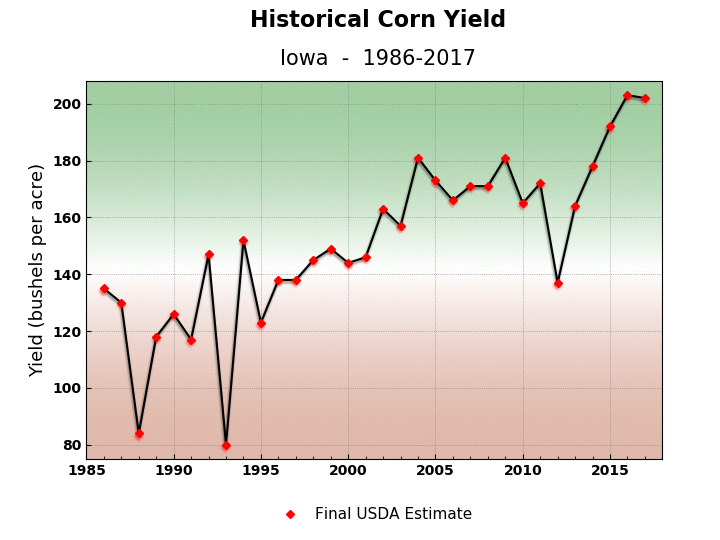 Despite September rainfall exceeding 10 inches in numerous counties in northern Iowa , 2016 was Iowa’s largest yield on record (203 bpa), as shown in the chart below of historical Iowa corn yield. 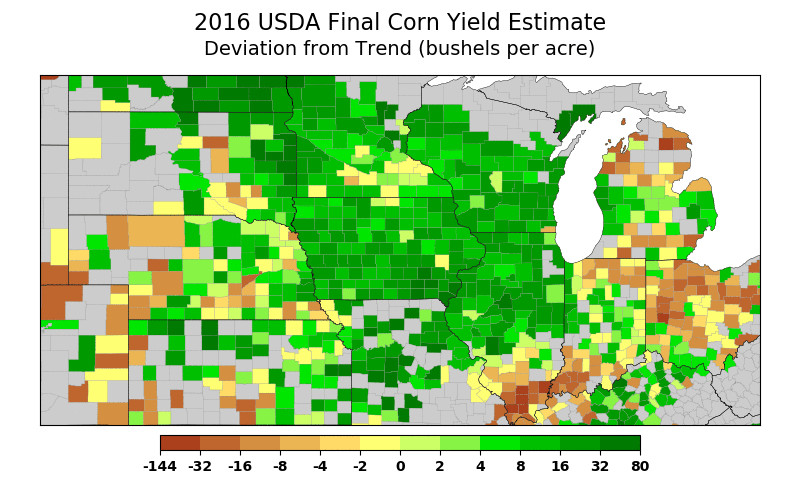 To examine whether the impacts of the heavy rain were detrimental to yield elsewhere, we can plot the county-by-county final USDA county yield for 2016 relative to the trend estimate for that year as shown below. Zooming into the Corn Belt, we see that nearly all of the counties in Iowa were above trend in 2016, and there is no indication that the band of heavy precipitation detrimentally impacted yield in Iowa. A bit farther north in southeastern Minnesota yields were closer to trend, and this less favorable outcome may be due to the heavy rainfall being accompanied by abundant cloud cover and cooler temperatures that were observed in Minnesota. 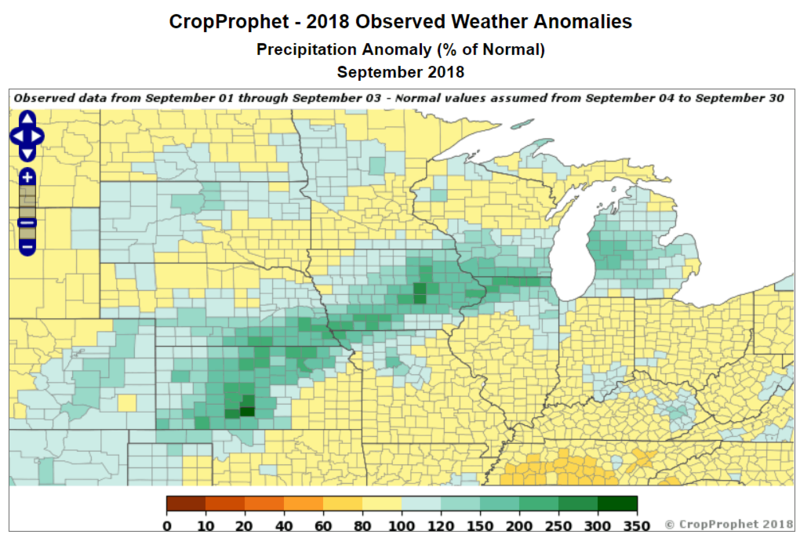 Thus, if it were to turn anomalously cool and cloudy in September this year, then corn yield may be more susceptible to the impacts from the recent heavy rains. 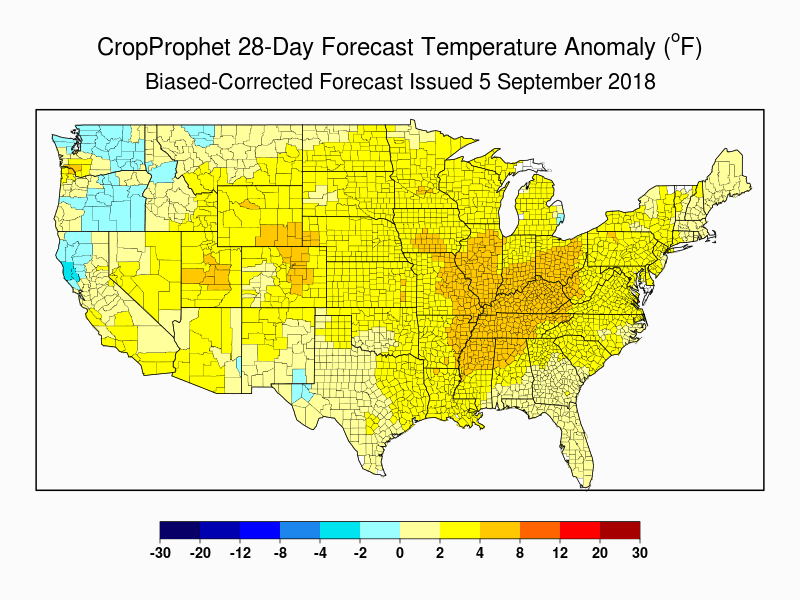 The latest long-range weather forecast from the US National Weather Service indicates generally warmer than normal conditions prevailing across the Upper Midwest through the end of September. If this weather forecast verifies, then the detrimental impacts of the recent heavy rainfall would be minimized, much like occurred in 2016.